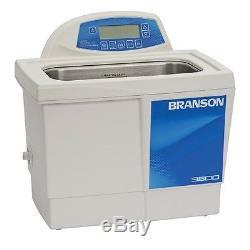 Branson CPX3800H Ultrasonic Cleaner w/ Digital Timer, Heater & Degas, & Temp Monitor. Bransonic CPXH heated ultrasonic baths are the most technologically advanced ultrasonic baths available. With programmable features, digital operation with power tracking capabilities to adjust for light or heavy loads, high/low power control, and degassing, the CPXH is the most versatile system available. The Bransonic CPXH digital bath is our most advanced ultrasonic bath yet. It features the benefits of heated cleaning with the ability to set temperatures from 20°C/68°F - 69°C/156.2°F. Plus, you get complete digital control with programmable capabilities and self-adaptive technology for consistent, worry-free operation - every time. All Bransonic baths can also be used for cell separation, sample preparation and degassing of liquids. Branson CPXH Series Cleaners Features. Sweep frequency eliminates standing waves and creates consistent cavitation throughout the tank. 40 kHz rugged industrial transducers. 99-minute digital timer and continuous ultrasonic operation. Can be heated up to 69°C/156.2°F and set for either Fahrenheit or Celsius. Last stored parameters are recalled when unit is turned back on. Degassing and conditioning the solution: The CPXH degassing period can be set up to 99 minutes. Extended degas time periods allow for "beyond cleaning" applications such as sample preparation, which includes degassing liquids, mixing and homogenization, dissolving solids, cell lysing, and dispersion of particles. Constant activity/power tracking automatically maintains the same ultrasonic power by adjusting for changes in liquid level and temperature caused by a light or heavy load. This helps ensure more uniform cleaning and consistent performance, even with multiple users or when bath conditions change. Programmable: The CPXH Series is completely programmable. Once the process is entered into the controller, the end user only has to start the program and they are free to leave the unit on its own to do the job. The programmable process allows the process engineer to choose the temperature set point at which the degassing and ultrasonic time periods are triggered to begin. Once the CPXH ultrasonic run time period is reached, the unit shuts off, delivering the same results - every time. Automatic ultrasonic activation: When the process temperature reaches the programmable set point, the ultrasonic cycle begins. This includes selectable times for both degas and ultrasonic processing. High/low power control: When cleaning delicate parts, the CPXH allows the user to lower the amplitude of the acoustic energy in the bath: 100% power to the tank for normal applications, 70% power for delicate applications. Manipulating the output waveform in this manner greatly helps to avoid damage to the components in the bath during the ultrasonic process. High-temp safety alarm indicator for protection from unit overheating. Temperature calibration is user accessible through front panel. Controls are located above and behind the cleaning tank in an easily accessible control tower panel, and raised above the tank to avoid damage from cleaning solutions. Convenient built-in pour drains are featured on. Tank drains with valves are incorporated on models 1.5-gallon and larger. CPXH Series Model CPX3800H Part No: CPX-952-318R. Voltage: 120V Tank Capacity Liters/Gallons: 5.7/1.5 Tank Size (L/W/D): 11.5 x 6 x 6 inches Overall Size (L/W/D): 15.6 x 12.5 x 14.8 inches Weight: 14 lbs. Frequency: 40 kHz Drain: Yes. For optimum cleaning results, Branson offers a line of accessories including perforated trays, solid trays, beaker covers and support racks for your application needs. The sale of this item may be subject to regulation by the U. Food and Drug Administration and state and local regulatory agencies. The item "Branson CPX3800H 1.5 G Ultrasonic Cleaner with Digital Timer Heater Degas Temp Mon" is in sale since Tuesday, April 25, 2017. This item is in the category "Business & Industrial\Healthcare, Lab & Life Science\Lab Equipment\Cleaning Equipment". The seller is "justmedicalstore" and is located in Bohemia, New York. This item can be shipped to United States, Canada, United Kingdom, Denmark, Romania, Slovakia, Bulgaria, Czech republic, Finland, Hungary, Latvia, Lithuania, Malta, Estonia, Australia, Greece, Portugal, Cyprus, Slovenia, Japan, China, Sweden, South Korea, Indonesia, Taiwan, South africa, Thailand, Belgium, France, Hong Kong, Ireland, Netherlands, Poland, Spain, Italy, Germany, Austria, Israel, Mexico, New Zealand, Singapore, Switzerland, Norway, Saudi arabia, Ukraine, United arab emirates, Qatar, Kuwait, Bahrain, Croatia, Malaysia, Chile, Colombia, Costa rica, Panama, Trinidad and tobago.